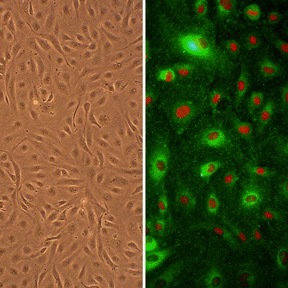 Human Umbilical Artery Endothelial Cells (HUAEC) provided by Cell Applications, Inc. have been used to investigate the influence of soluble factors secreted by tumor cells on the expression of cell surface antigens by endothelial cells (Moehler, 2008). It was determined that tumor-derived factors activated transcription of FUT1 which lead to enhanced expression of CD174, a molecule involved in cell-cell adhesion and migration during tumor angiogenesis. (Click to Enlarge) Human Umbilical Artery Endothelial Cells, HUAEC (L). HUAEC immunolabeled with anti-vWF antibodies (green); nuclei are stained with PI (red) (R). Bowers, S., Meng, C., Davis, M., and Davis, G. 2015. Investigating Human Vascular Tube Morphogenesis and Maturation Using Endothelial Cell-Pericyte Co-cultures and a Doxycycline-Inducible Genetic System in 3D Extracellular Matrices. Methods in Molecular Biology, 1189:171-189. Moehler, T.M., S. Sauer, M. Witzel, M. Andrulis, J.J. Garcia‐Vallejo, R. Grobholz, M. Willhauck‐Fleckenstein, A. Greiner, H. Goldschmidt, and R. Schwartz‐Albiez. 2008. Involvement of α 1‐2‐fucosyltransferase I (FUT1) and surface‐expressed lewisy (CD174) in first endothelial cell–cell contacts during angiogenesis. J. Cell. Phys. 215:27-36.